Introducing Blackmagic Studio Camera, the world’s most advanced broadcast camera for live production! Inside its incredibly tough, lightweight magnesium alloy body you get a massive 10” viewfinder, talkback, remote camera control, tally indicators, phantom powered microphone connections, and SDI or user installable optical fiber connections that let you connect to your switcher with a single cable! 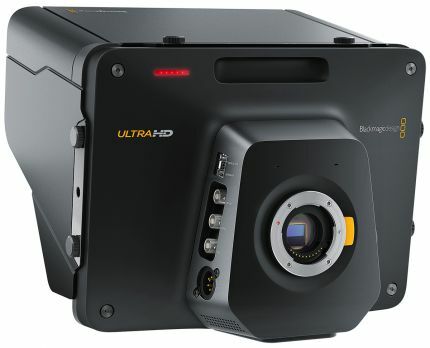 The Blackmagic Studio Camera HD is packed with all the advanced features you need for multi camera production and broadcast! I ris, focus, zoom on supported lenses. 12G Optical Fiber Input and Output capable. 2 x XLR , phantom power. Aviation headphone jacks (Fixed Wing Plugs) output for talkback and audio monitoring. Blackmagic SDI Control Protocol. 2.5 mm LANC connection for lens control.